A celebration of my favorite picture books for kids. Hello, hello, hello! It's great to be back on Mr. Brian's Picture Book Picks. I had the privilege and the honor of serving on the 2017 Caldecott Award committee. It was a complete joy to work with 14 amazingly insightful individuals to pick this year's honorees. 2016 proved to be an incredible year for illustrated books. I cannot reveal anything about our fantastic conversations, but I am proud to give a shout out to this year's winner and the four honor titles (in alphabetical order by title). The winner of the 2017 Caldecott Medal! Radiant Child: The Story of Young Artist Jean Michel Basquiat, illustrated and written by Javaka Steptoe, published by Little, Brown and Company, a division of Hachette Book Group, Inc. The ALSC Caldecott page says it best: "Like Jean-Michel Basquiat’s work, Steptoe’s illustrations radiate energy and immediacy. A patch-worked canvas of scavenged wood, painted and collaged with photos, and images of human anatomy, evokes the improvisatory nature of Basquiat’s art. “Radiant Child” resonates with emotion that connects Steptoe with Basquiat and Basquiat with young readers." This is the first time the Coretta Scott King Illustrator Award Winner and the Caldecott Award went to the same book! Du Iz Tak?, illustrated and written by Carson Ellis, published by Candlewick Press. From the ALSC Caldecott Page: "A diverse community of anthropomorphic bugs is intrigued by an unfurling sprout. Carson Ellis deftly depicts the mysteries of life in an imaginary, natural world. Through intricate details and the witty humor of a made-up language, “Du Iz Tak?” is a treasure trove of visual and linguistic literacy." Freedom in Congo Square, illustrated by R. Gregory Christie, written by Carole Boston Weatherford, published by Little Bee Books, an imprint of Bonnier Publishing Group. From the ALSC Caldecott page: "As they work throughout the week, slaves look forward to their afternoon of music, hope, and community in Congo Square, New Orleans. Christie’s folk-art inspired paint and collage images powerfully capture the emotions of this little-known historical event. Vibrant color and brilliant use of line heighten the impact of the rhyming couplets." Christie also received a Coretta Scott King Illustrator Honor for this powerful book. Leave Me Alone!, illustrated and written by Vera Brosgol, published by Roaring Brook Press, a division of Holtzbrinck Publishing Holdings Limited Partnership. From the ALSC Caldecott page: "At the end of her rope, Granny is desperate for time alone to finish knitting sweaters for a house filled with dozens of rambunctious children. Brosgol’s expressive watercolor and cartoon art presents a genre-breaking journey taking Granny from the traditional forest setting to the mountains to the moon and beyond." They All Saw a Cat, illustrated and written by Brendan Wenzel, published by Chronicle Books LLC. From the ALSC page: "A cat’s walk through the world becomes a surprise-filled exploration of perspective and empathy. As the feline encounters a variety of creatures, the thoughtful composition paired with spare language and repetition focuses on each individual’s perception of it. Wenzel’s use of a range of art materials reinforces the idea that the essence of a cat might be in the eye of the beholder." Congratulations to these five outstanding picture book creators. I see something new every time I look at these unforgettable books. This blog will be taking a little vacation. Until then, please feel free to scroll down and look at some of the capsule reviews I have written over the past few years. 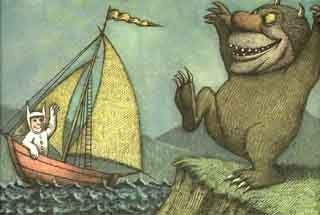 Thanks for reading and enjoy every wild rumpus! 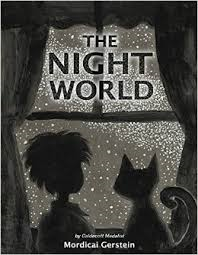 The Night World, written and illustrated by Mordicai Gerstein. According to an author's note, the Caldecott winner (The Man Who Walked Between the Towers) based this wondrous book on an experience he had as a four year old startled by how different the world looked at night, all dark shadows and "strange silvery shapes." His fantastic illustrations, done in acrylics, pen and ink, and colored pencil, capture this experience quite effectively as a boy follows the orders of his cat Sylvie, who wakes him up and then leads him through a sleepy house and into the backyard. Grays and blacks fill the page for a great stretch of the book, with Sylvie's green eyes making a striking impression. Gerstein turns this into a total sensory experience--you feel the wet grass and the warm sweet air. I love the questions the boy asks: "Are these shadows roses?" Meanwhile, shadows of animals like porcupines and rabbits appear, telling the child that something cool is coming. And then Gerstein gives us a beautiful sight: colors fill the page as a sunrise appears, causing the nocturnal animals to run away and the boy to experience total wonder. A charmer from a masterful artist. Float, by Daniel Miyares. This absolutely masterful wordless book reminded me quite a bit of Ezra Jack Keats (A Letter to Amy, The Snowy Day) and I mean that as a sincere high compliment. 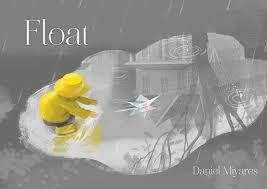 The story begins with a child and father making an origami paper boat. The boy's bubbly mood defies the grayness of the rainy stormy day as he puts on his bright yellow raincoat and skips outside with his creation. Miyares' illustrations brilliantly convey the kid's fluctuating moods, giving us switches in perspective and point-of-view, and one beautiful spread (which reminds me of an impressionist painting) providing a breathtaking blurry vision of the boy as it pours. The drama kicks in when a stream whooshes the boat away, with the distraught boy in hot pursuit. Miyares does a fantastic job showing the distance between him and the boat, using the book's long rectangular shape to great effect. When the boat falls into a storm drain, all goes black, and then sadness follows when he discovers that it has become a soaking mess. Fortunately, his loving pop awaits with a life-affirming hug and a handy hair dryer. It all leads to a heartwarming ending with rays of sun filling the pages with yellow warmth and the resourceful child creating a new origami paper airplane that soars. Throw in instructions on how to make a paper boat and paper airplane and you have a winner. A beautiful book, one of the year's very best. I Won, written and illustrated by Ruth Wielockx. This fast-paced import (translated from the Dutch) shows a bunch of girls and boys engaged in one wild race, driving a wide variety of vehicles. Just when one kid pulls ahead in, say, a tricycle, another child zooms past on a scooter. Young readers will love the vast array of vehicles: a jeep, a quad bike (! ), a cool bus covered with flower paintings. I love the design of this book: the vibrant illustrations pop off the page, the name of each new vehicle is in bold letters, and each spread has a solid, bright backdrop. Those familiar with my blog know that I love surprise endings, and this title has a great one. How are these pint-sized characters driving fire trucks and planes? All is revealed on a charming, surprising final spread. 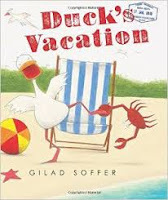 Duck's Vacation, written and illustrated by Gilad Soffer. Poor Duck only wants to sit peacefully on the beach, but you--yes, YOU, the reader--are causing great distress by turning the pages. With every turn of the page, something horrible happens to Duck, ruining the peaceful zen state Duck tries in vain to create. Soffer's titular character pleads directly to the reader to stop turning the pages. But do we listen? No, so terrible (yet hilarious) things keep happening to Duck: a gull poos on its head, a crab bites its foot, and there's even a sudden inexplicable snowstorm. This meta picture book page turner keeps you giggling from start to finish, leading to a hilarious punch line that Duck had a stunt double for some of the more treacherous moments in the story. 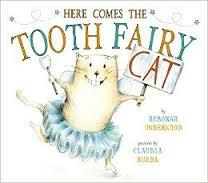 Here Comes the Tooth Fairy Cat, written by Deborah Underwood, pictures by Claudia Rueda. The mischievous feline returns and has a big huge dream: it wants to meet the Tooth Fairy! The narrator talks directly to the cat in a most amusing manner, asking our protagonist questions, responding to the character's humorous facial expressions (rendered with ace comic timing by Rueda). After the cat tries to trick the Tooth Fairy by leaving the tooth of a comb, a strange package arrives holding a Tooth Fairy costume and a note saying "nice try" but hey, maybe the cat can work as an assistant to the legendary being. The presence of a mouse helper adds more laughs, but a surprisingly effective lesson in friendship and teamwork follows. Watching the cat earn its stripes is a joy. 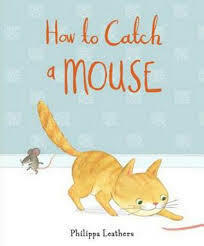 How to Catch a Mouse, written and illustrated by Philippa Leathers. This extremely adorable yet slyly funny story introduces us to Clemmie, a pint-sized striped orange cat who also happens to be "a brave, fearsome mouse catcher." A wonderful disconnect between text and illustration occurs right away as the narrator brags about Clemmie's abilities, ignoring the fact that we can see the mouse sneaking around either behind the cat's back or hidden in plain sight. There's a big laugh when we read that Clemmie is such a fearsome mouse catcher "that she has never even seen a mouse" (this follows an illustration where the mouse has been reading a how-to-catch-a-mouse-guide over Clemmie's shoulder). Turns of the pages lead to surprises as Clemmie creeps up on what looks like parts of a mouse but turn out to be other objects. When our feline hero realizes that she has been tricked by the mouse, there's a moment of sadness, but a sweet ending has the cat bouncing back with tricks of her own. 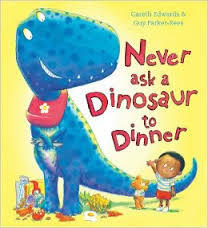 Never Ask a Dinosaur to Dinner, by Gareth Edwards and Guy Parker-Rees. This playfully absurd (and yet at times truly startling...in a funny way) cautionary tale advises children not to invite certain large creatures into their houses because chaos will ensue. The rhyming text pleads with you not to "ask a dinosaur to dinner" because "a T. rex is ferocious/And his manners are atrocious,/And you'll find that if he's able..." (turn the page) "He will eat the kitchen table!" (larger font used). The cartoonish, colorful illustration shows the mom fainting (who can blame her?). More advice follows, and we learn why we shouldn't share our toothbrushes with sharks or use tigers for towels. Even inviting a cute-looking barn owl into bed may seem snug at first, but watch out!!! Yet we do finally learn something that will lead to a restful night sleep, and surprisingly we learn that this has been a bedtime story all along. 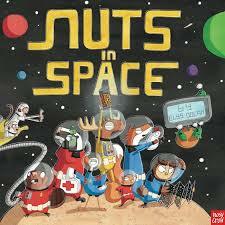 Nuts in Space, written and illustrated by Elys Dolan. Dolan follows up her inventive, bizarrely funny Weasels with this delightfully madcap spoof of outer space adventures. A bunch of furry space travelers must bring home their amazing discovery: the Lost Nuts of Legend! However, the trek is wild and bumpy as they become lost and encounter villains and comical mayhem along the way. Each spread contains several comical details, punchlines, and little jokes. Cartoon bubbles pop up over the characters' heads and for those in the know, lines spoofing Star Trek and Star Wars abound (love that the Death Banana, a tasty spoof of the Death Star, has been "terrorizing since 1977"). Interestingly enough in all the chaos, the characters' personalities emerge and tickle the funny bone. This is a funny book that can be visited and visited again for maximum comic impact. 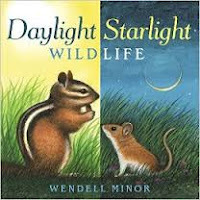 Daylight Starlight Wildlife, written and illustrated by Wendell Minor. The consistently excellent Minor specializes in books about nature and animals. His latest introduces young readers to creatures who come out during the day, and others who frolic at night. In each artfully rendered realistic spread, he skillfully juxtaposes the antics of the daylight animals with a nocturnal counterpart. The concise yet action-packed text gives a lot of information with very few words. One spread, for example, shows a cottontail rabbit and her kits as "they hop into the field and hold still all is safe" on the left hand of the page while, on the right, a "pink-nosed opossum plods through the field and forages for food with her family on her back." A variety of animals--winged and otherwise--appear. The informative back matter offers a bunch of "Fun Facts" about each animal introduced. A beautiful book that presents its nature lessons with skill and grace. I work as a Children's Librarian at the Evanston Public Library in Evanston, IL and one of the best parts of my job is doing storytime. 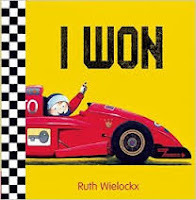 I enjoy recommending picture books that work for me with groups both large and small. I have served as picture book selector for the library since 2001, and before that selected picture books for the Oak Lawn Public Library from 1996 to 2001. I present an annual Favorite Picture Books countdown for the public in December at Evanston Public Library. I have served on the Monarch, Bluestem, and Odyssey Awards committees, and review for Booklist magazine. Feel free to share your ideas or thoughts in the comments section or contact me at bwilson@cityofevanston.org. Thank you!